I know I had promised you Pumpkin recipes this September in my Facebook post. 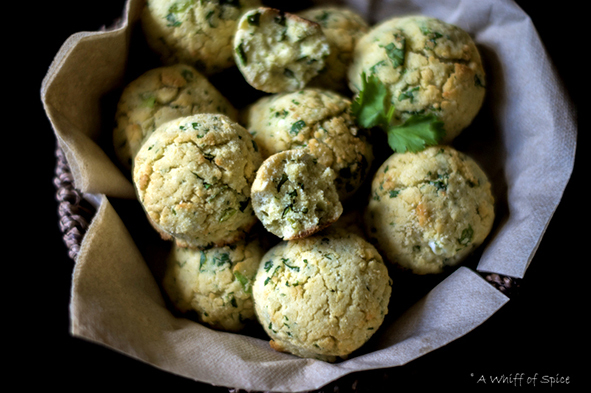 But these Coconut Flour Biscuits with Scallions and Cilantro, that I had whipped up on a whim, turned out so utterly delicious, that I couldn't resist sharing these with you'll. Coconut Flour is a phenomenal ingredient which I have recently discovered. I am not gluten intolerant but have seen how badly it affects my blood sugar, every time I consume it. I'm consciously trying to avoid Wheat Flour as much as possible and practicable. Coconut Flour is made from ground and dried coconut, after all the Coconut Milk had been extracted from it. It doesn't contain any grains or nuts and doesn't cause any digestive or autoimmune responses like other grain flours do. Coconut Flour has high levels of healthy saturated fats in the form of medium chain fatty acids (MCFA). These are used by the body easily for energy and help to support a healthy metabolism and balanced blood sugar levels. Coconut Flour supplies an impressive 61% dietary fiber! Because fiber essentially cannot be absorbed by the body, some of the calories and carbohydrates found in Coconut Flour aren’t even absorbed and used. They move right through the digestive tract, taking toxins and waste along with them. Coconut Flour is a low glycemic food and does not spike blood sugar levels. Recipes containing Coconut Flour can actually help to lower the overall glycemic impact of the food and to support stable blood sugar levels. Coconut Flour helps in healthy digestion; it has a high nutrient density and it can aid in heart health too. Because of its high amount of soluble and insoluble dietary fiber and its healthy MUFA (Mono Unsaturated Fatty Acids) content, Coconut Flour has the ability to help lower LDL Cholesterol levels and Serum Triglycerides. 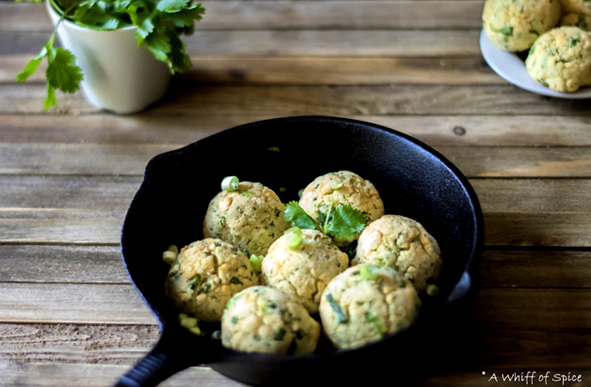 Coconut Flour Biscuits with Scallions and Cilantro is Low Carb, Diabetic Friendly, Gluten Free, Paleo Friendly and Keto Approved. These light, fluffy and slightly crumbly Biscuits are the perfect vessel to soak up chili, soups and stew this winter. This lovey Biscuit is not to be confused with sweet English Biscuits that we dip in our teas. The American Biscuit is a small baked good with a firm browned crust and a soft interior, very similar to the British scones. They are made with baking powder or baking soda as a chemical leavening agent instead of yeast. It is mainly eaten for breakfast with a side of gravy and scrambled eggs. They are often served with soups or stew for dinner as well. When it comes to cooking, Coconut Flour is extraordinarily absorbent. And if you are not careful, you will end up with dense and dry baked goods. You need to increase the amount to egg and other wet ingredient to make soft and moist baked goods. 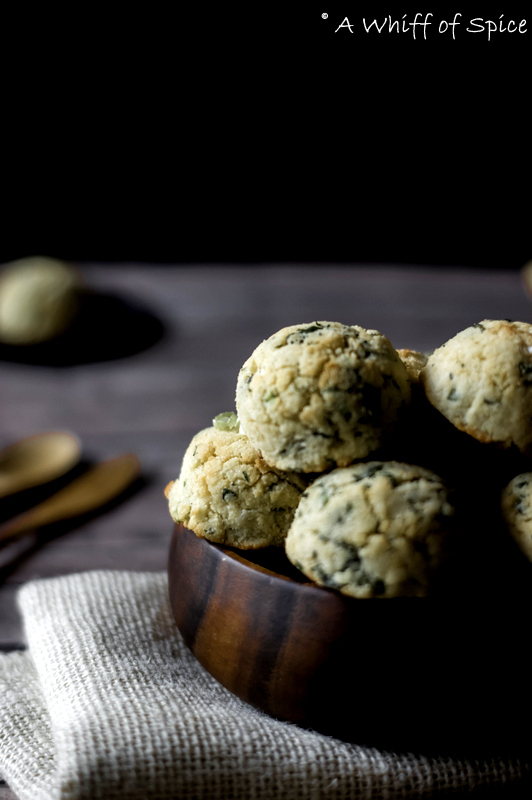 This recipe uses 6 eggs for one cup of Coconut Flour, which might seem a lot, but it will result in a light and fluffy biscuit. 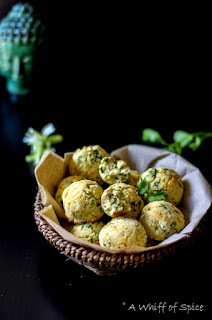 To flavor the biscuit, I have used Scallion (also known as green or spring onion) and Cilantro/Coriander Leaves. Any other herbs can be used in place of cilantro too. Or if you prefer, swap scallion and cilantro for a cheese and cooked bacon bits. It is Sid's favorite combination after all. If you prefer it sweet, add 2 tablespoons of honey/maple syrup and a teaspoon of cinnamon (instead of scallions and cilantro). Serve with a cream cheese glaze, for an "almost guilt-free" Cinnamon Roll breakfast! Or how about making it plain with just a hint of honey or maple syrup and serving it with a side of fresh fruit and whipped cream. I would be in food heaven! As for now we love enjoying these beautiful Coconut Flour Biscuits with Scallions and Cilantro with a side of scrambled eggs, fresh fruits and coffee for a grand weekend breakfast. 1. Preheat the oven to 375F. Line a baking sheet with parchment paper or Sil-Pad. 2. In a large bowl shift, coconut flour, salt and baking powder. 3. Add the softened coconut oil and the eggs and using a hand mixer or a stand mixture, mix till the mixture looks moist and crumbly, like wet sand. 4. Add the grated garlic, minced scallions/green onion and cilantro/coriander leaves and mix well with a spatula. 5. Using an ice cream scoop or a tablespoon, scoop out about 2 tablespoon of biscuit mix and form into a ball and place in the parchment lined baking sheet. The mix would yield about 12 biscuits. 6. Bake in an 375 F oven for 12 to 14 minutes, or till the tops are golden. Let it cool for about 10 minutes before serving. 7. Store leftover in an airtight container at room temperature fro 2 days. Freeze up to 6 months. Notes/Tip: For variation you can add cheese and bacon, instead of scallion and cilantro. Or make it sweet by adding cinnamon and honey instead. Or just make it plain without any add-ins. This makes coconut flour a favorite among paleo dieters, gluten free eaters including those with Celiac Disease or a gluten sensitivity, those with digestive problems like leaky gut syndrome, anyone with a nut allergy, those with diabetes, vegetarians, and just about everyone else in between. I don't like pumpkins actually. But these cookies are creating a craving for it inside me. Can you share its procedure or delivery criteria. I would like to have some.